Designed by Marco himself, the new menu features classic dishes made using a range of seasonal ingredients. Known for his love of simple traditional cooking, diners can explore a new range of starters, main courses and desserts. Steak remains at the heart of the new menu, all sourced from Royal Warrant appointed butcher, Campbell Brothers. 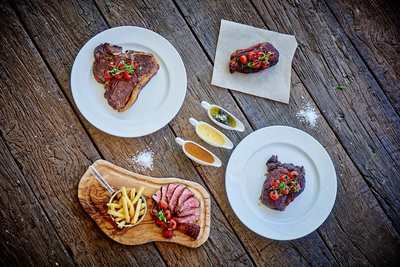 Alongside classic cuts including fillet, rib-eye and Chateaubriand, Côte de Boeuf from the Duke of Buccleuch Estates is a brand new sharing option for diners to enjoy. Inspired by classic British dishes and reflecting Marco’s passion for simplicity, there’s also a range of exciting new main courses aside from steak. From Pork Belly Marco Polo, to Seared Yellowfin Tuna Steak and The Steakhouse Burger, the new menu is filled with favourites designed to always stand the test of time. Elsewhere on the menu, diners can choose from an extensive range of starters, including Marco’s Lobster Macaroni, Welsh Rarebit with Poached Egg and Crème Du Barry, whilst a selection of sides, including Wilted Baby Spinach and Garlic Button Mushrooms, provide the perfect accompaniment. For those with a sweet tooth, the new menu also delivers an exciting selection of new desserts, including Mr White’s Rice Pudding and The Box Tree’s Eton Mess. Not forgetting the old favourites, the Classic Knickerbocker Glory, Cambridge Burnt Cream and New York Baked Cheesecake also feature on the refreshed menu. The new menu is now available at Marco Pierre White’s Steakhouse Bar and Grill. Book your table now at mpwrestaurants.com.